I love parchment paper! I buy large packages of it and use it often. Parchment paper quality varies, it can be thin tissue-like paper, which doesn’t hold up to much heat and falls apart quite easily, or it can be tough enough to use several times before discarding. If you find a brand you really like, stick to it as there are many cheap imitation parchment papers that are not really parchment paper and cannot handle the heat or use. The silicone impregnated parchment paper seems to work better and last longer than the plain parchment paper. Many bakers like to use the unbleached parchment paper, I like either. Baker’s Mark is the brand I use. Most parchment papers are rated at around 440F for max temperatures. However, I bake with them up to 500F and they do fine, sure they might need to be tossed when I’m done baking (they get dark and brittle), but they work great and I often use them at least twice. I also enjoy using silicone mats at times (the original brand is called Silpat). A silicone mat seems to better for use when your baked item needs to spread. Most cookies baked on the silicone mat spread more and don’t bake up as high(puffy) as those baked on parchment paper. Thin spreading cookies like tuiles do well on the mat. Macarons and other types of meringue based goods bake up nicely on the mat. You can also use the mat for shaping sticky candies and any other type of food that likes to stick. A silicone mat needs care to prevent cuts, so don’t use a knife while working on one. A fiberglass mesh is embedded in the mat and you really don’t want fiberglass fibers to get into your food! 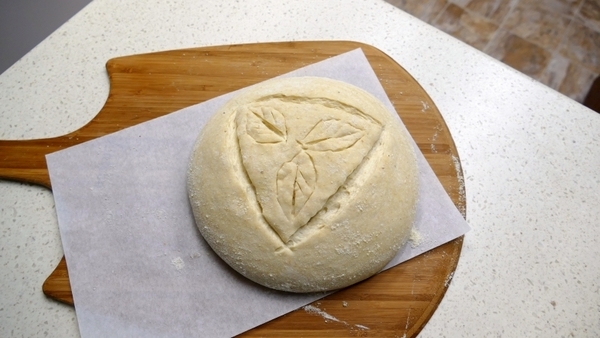 Most mats seem to rated for the higher heat that is needed for baking sourdough breads (up to 480F). However, I think they are intended for lower baking temperatures and will last longer if used accordingly. I use a silicone mat with the Forneau oven insert and find that the silicone mats work just fine at the higher temperatures (for bread baking), although perhaps over time they might break down earlier. Do you like parchment paper or silicone mats best? Which do you prefer and why?